After winning Best Animation at Harlem and being the runner up for Audience Favorite at Palm Springs, Le Gouffre has now won a third award : “Best Visual Effects”. A big thank you to the Golden Orchid International Animation Festival for this honor! Last week, Carl flew to California for a few days to represent the team at the San Diego Film Festival. It was a great opportunity to promote the film, meet new people and even answer some questions from the audience during a Q & A – all in all, a very pleasant first presence outside Montreal. Unfortunately, Le Gouffre didn’t win, but congratulations to The Dam Keeper, which won the award for best animated film! We have two new festival selections to present this week. First, we are pleased to announce that it will be possible once again to watch the film in Montreal at the SPASM festival this October 24th. You can already come here to get your ticket! Also, the film was selected at the Kino Fest in Romania. This announcement comes a little late since the presentation has already taken place, but we wanted to share it with you anyway. Have a good October everyone! Important message to all those who contributed to our Kickstarter campaign last fall and who might have missed the last update: your rewards have been sent by private message on your Kickstarter account. If you have not received any email notification, you can login to your Kickstarter account and go in your inbox to find all the download links. Don’t hesitate to contact us if you have any trouble! This week has been very eventful. First, we had the pleasure to hear that our film won the award for best animated film at the Harlem festival. We are especially thrilled since that’s our very first “first prize”. Many thanks to the judges, and sorry we couldn’t make it in person! 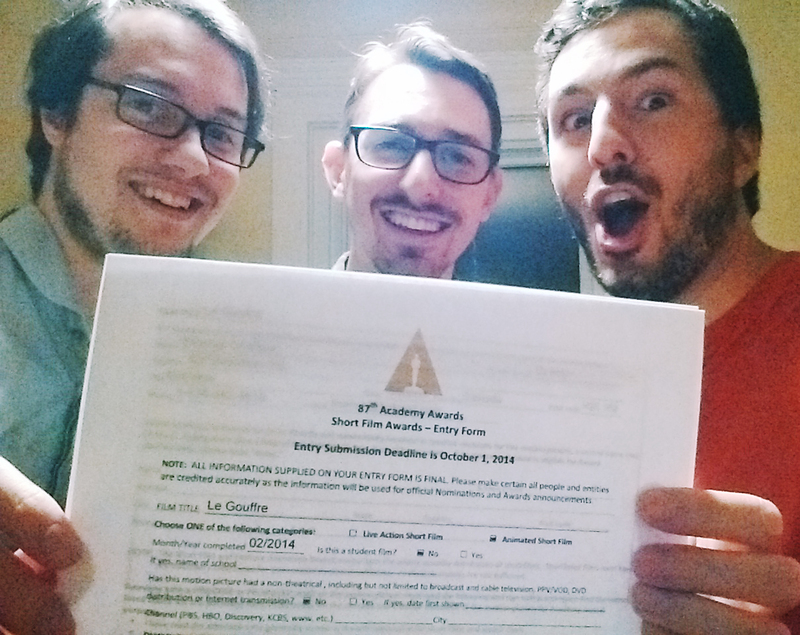 Also, we officially sent our film to the Academy for it to be taken into consideration for the Oscars. Here we are a few minutes before sending the precious package in the mail! And to top it all, Le Gouffre has been selected in three new festivals! Thank you very much for your support everyone! To be notified of all the latest news, don’t forget to go « like » our Facebook page. We’re so close to a thousand subscribers! It’s official : Le Gouffre is currently being screened for paid admission in Los Angeles at The Nuart Theater (September 2-4, 12:00-2:00 pm), so that means it should be eligible to be sent to the Oscars! Now we just have to fill in the official form and send our DCP to the Academy by October 1st. We’ll let you know how that goes! That’s it for this week but stay tuned for all the festival results! As you can see, we did a major update to our website, since it was originally meant as a production blog and it didn’t really fit now that the film is over. Our teaser is now in the forefront and all of the information on the film is at direct reach, including the complete list of official selections and the upcoming festivals in the new PRESS page. We hope you’ll like it! Here is a list of the new festivals that will be screening Le Gouffre in the upcoming months! Up next : find a way to screen our film in a Los Angeles theatre for three consecutive days before September 30th, so the film can become eligible for the Oscars. Indeed, it’s now the only way we have left since we didn’t get the chance to win a first prize in a major festival until now.